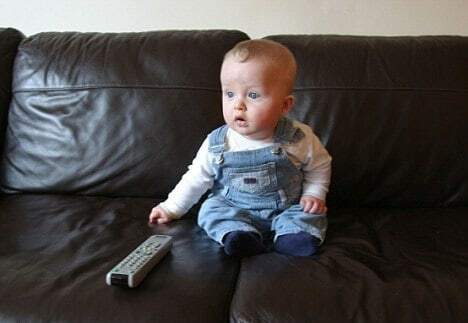 When Can Baby Watch TV & What Is The Side Effect? ​TV time can be a fun bonding experience within a family. You get all snuggled up with your blankets and snacks, and just enjoy some entertainment together. It can be exciting when you add in a new little member of the family because there is just so much for her to learn and enjoy. However, there is great debate on the subject of babies watching TV. 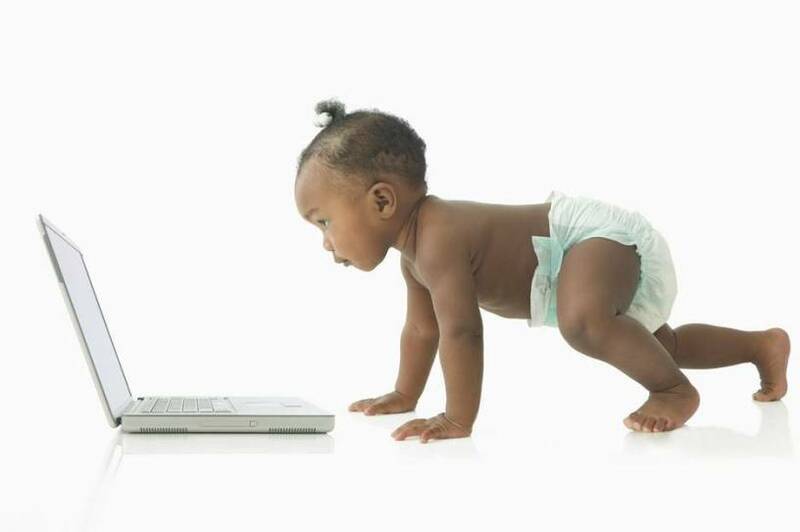 While some may think it is okay in moderation, others believe that babies should not be exposed to electronic screens due to developmental delays. When Can Baby Watch TV? Why Do Babies Receive Screen Time? When is TV Watching a Problem? 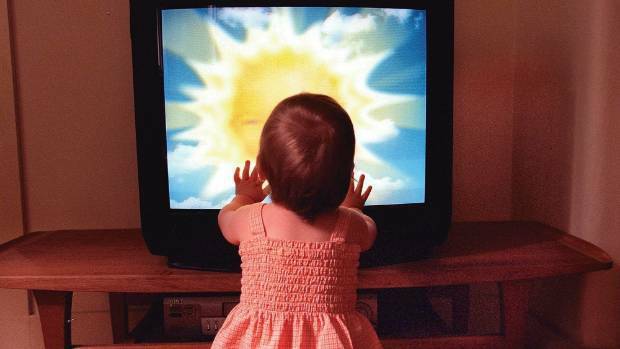 Can TV Have a Negative Effect on Baby’s Eyesight? How Can You Promote Safe Screen Use? About 10 years ago, the American Academy of Pediatrics (AAP) concluded that television viewing by children under the age of two should be avoided due to negative side effects it may have on a child. Babies do not understand what is happening on TV before this age, which defeats the purpose of so-called “educational” entertainment. They may also suffer developmental delays. This may not be directly due to the television itself, but more due to the fact that parents are not teaching while children are absorbed in the media box. Despite the potential harm that TV watching can do to a baby, there is still an alarming amount of time that they are exposed to it throughout the day. According to a study by the Children’s Hospital in Boston, babies at 6 months of age watch almost an hour of television every day, and the number just grows as they get older. As a result, these children may have lower language and cognitive skills than the average 3-year-old who was not exposed to television. Now, when we talk about TV, we are referring to any form of electronic screen; these can produce the same negative side effects that TV does. With our world becoming increasingly digitized, babies are now exposed to smartphones and tablets on a regular basis, either watching Netflix or YouTube, or even playing games. However, we can also thank modern technology for the ability to keep in touch with our friends and family who live far away, and your baby can be a part of it too. Video chatting, even though done on an electronic screen, is not harmful to your child and, in fact, can be beneficial for them. Babies can learn much more from video calls than watching an “educational” program because the person on-screen is actually interacting with them. It is also possible for a baby to make a connection with the person they are talking to through the screen, especially when the parent facilitates the conversation and helps them to interact. 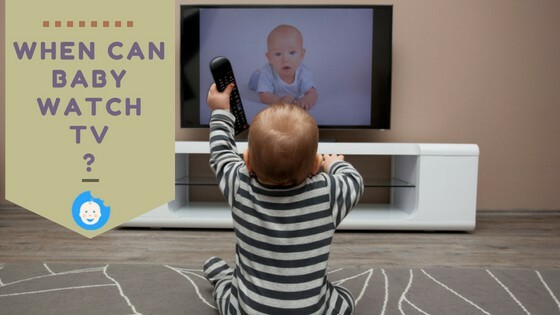 With all of the warnings about the negative effects television can have on a baby’s development, it can be easy to wonder why it is still happening – especially when there is an average of 40% of 3-month-olds watching regularly. Well, even the most well intentioned parent can cave on their no-television rule for a couple of reasons. One of the main reasons a baby may be exposed to television is due to the educational deception. About 29% of parents that participated in a survey (in Washington and Minnesota) believed that the media they were showing their babies were educational or beneficial for their brains. There are several shows that are marketed toward toddlers, claiming that they will make them smarter, but this is simply not the case. Until about the age of two, babies cannot comprehend or retain what is happening on the screen. Their language develops better when they are able to babble to their parents and receive a response. Playing with toys is also more beneficial, as it allows them to practice and develop their motor skills. Another trap that parents can fall into is the need for TV as a time filler. It can be easy to run out of things to do with your baby – after all, they cannot do much to entertain themselves – and it can be easy to allow the TV to entertain and take up some time to give yourself a break. Some parents may even rely on the television to appease their baby or toddler who is fussy or wound-up. In the same Washington-Minnesota survey, about 23% of parents claim that they use TV to entertain or relax their child. Sometimes a parent simply becomes desperate for a few minutes of quiet and no-effort entertainment. As mentioned previously, babies under the age of two cannot understand what is happening on the television due to their brain’s current development. To better understand why television is not beneficial for them, it is best to look at what they actually see when they are watching. First off, the television is really just an overstimulating array of colors and noise. Your baby may not even be able to tell that there are pictures at first, and when she can, she may not be able to digest what is happening, as the average scene only lasts 5-8 seconds. Surprisingly, there can be a lot of violence hidden within children’s shows. Whether we have become desensitized or we do not view cartoon violence as scary or harmful, it can have a drastic impact on our children. Just because it is animated and advertised as child-friendly, it does not mean that it is completely safe for children to watch. Too much violence can cause toddlers to develop bad habits such as biting and shoving. And let us face it: to young babies, violence on TV is just plain shocking. Babies are born knowing nothing; the first two years of life are the most crucial for brain development. 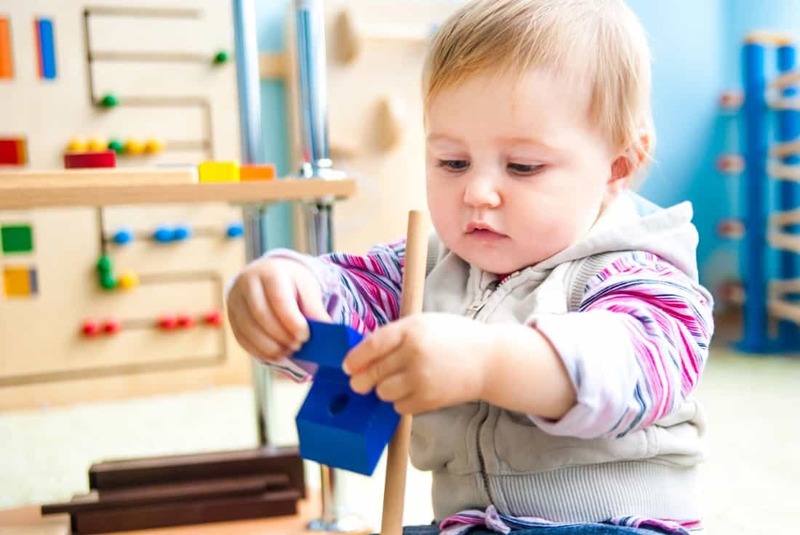 Connections are made and a child begins to understand more about the world – the names, feels, tastes, smells, and sounds of everyday objects. It is important to keep this in mind when sharing video media with your child. She does not have the ability to separate fiction from reality, which can have negative effects of her beliefs and behaviors. She may suddenly have trouble sleeping alone at night for fear of monsters, or she may try to imitate what she has seen and seriously injure herself. Besides the inability to comprehend what is happening on the screen, watching TV under the age of two can cause negative and potentially long-term effects on a baby’s development, both physically and mentally. We have already established that when a baby is watching TV, they are not working on motor skills. Even if they are given a choice between TV and toys, a baby will likely choose TV thanks to its mesmerizing glow. Sitting in front of the TV can also contribute to childhood obesity. Television watching is a learned habit, and the more TV a child watches, the more they want and the less they want to play and exercise. With an hour of television increasing the likelihood of childhood obesity by up to 60%, babies are already at risk (due to the average 6-month-old watching nearly that much every day). Toddlers are also learning how to concentrate and focus at this age, and television can detract from that, increasing the change of developing some form of attention deficit. Children’s TV programming is constantly changing and does not force them to deal with anything tedious, and exposing your little one can decrease her attention span, creating potential future problems. When the TV is on, there is less talking which means less learning. Even passive watching – whether the child is playing while the parent watches or the TV is simply on for background noise – can have negative effects on speech development and learning due to decreased interaction between parent and child. Your baby has a world of things to learn, and her best source of knowledge is you. If you are not speaking to or interacting with her, relying on TV to educate her, there is an increased chance of delayed language development when she starts school. You may also find that it is hard to get your child’s attention when she is watching TV; it may seem like she is ignoring you or that she cannot even hear you with her eyes glued to the screen. If you are unable to get her attention, you are unable to interact, missing out on valuable bonding and teaching time. With all of the bright flashing lights and vast array of colors that TV puts out, it is easy for a baby to become overstimulated, which can in turn negatively affect their sleep patterns. In a study organized by the University of Auckland in New Zealand, it was found that children who watched TV within 90 minutes of their bedtime took much longer to fall asleep than those who did not. Television activates adults’ and children’s brains alike, which can make it harder to prepare for sleep when the time comes. It has also been found that the blue backlight from TV and mobile devices can disrupt circadian rhythms, tricking the body into believing it is day instead of night. Whether or not we want to admit it, it is easy to become addicted to television, and our children are not exempt from this risk. Babies may not be able to ask for their favorite TV characters like toddlers can, but they can become increasingly inconsolable without the use of television if they watch it on a consistent basis. They may lose interest in their toys and only want to watch TV. One of the main concerns you will hear voiced by parents is the effect of television on their child’s eyesight. The good news is that there is very little you need to worry about in regards to this. Children’s eyes are more resilient than adults’ are, and any vision concerns that may arise are likely due to something else. Most parents notice common signs that make them believe that the TV may be giving their babies vision problems. They may stare, squint, or blink a lot, which seems like they cannot see very well, but these signs are likely due to the overstimulating or mesmerizing effect that the TV has on them. Many parents also fear for their babies’ eyesight when they find them watching TV too closely. It is unlikely that this will strain your baby’s young eyes, but it is not a sign to ignore. We will talk about this more in a bit. 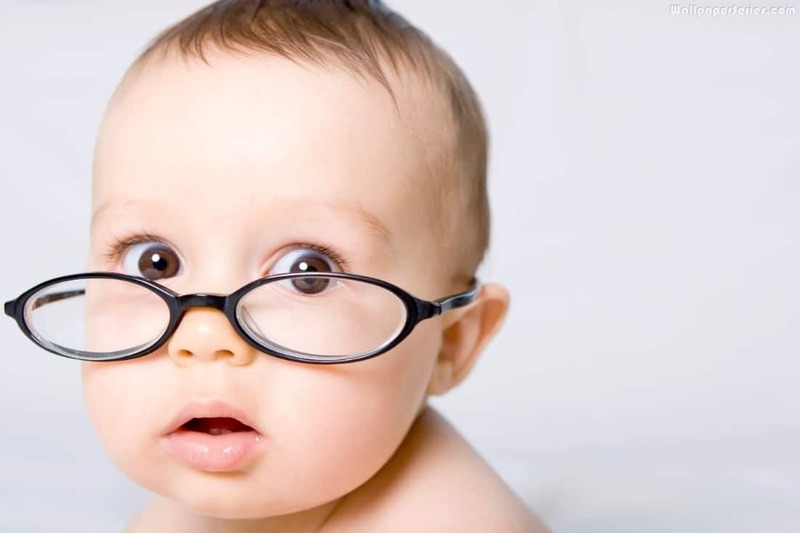 While sitting close to the TV or staring at a computer screen for long periods of time can put strain on an adult’s eyes, possibly even resulting in the need for glasses, it is unlikely that this will injure a child’s eyes. 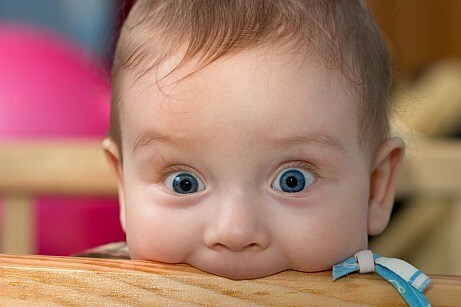 According to the American Academy of Ophthalmology, kids and babies can focus up close much easier than adults can. It is also likely that reading or watching things close up is just a habit your child has developed. You can rest easy knowing that this habit is usually outgrown at some point. As mentioned previously, there are certain signs that you should not ignore, as they could be signs of a vision problem resulting from something else. If your child seems to be sitting close to the TV because they cannot see from further away, you should take them to the doctor, as it could be a sign of nearsightedness. In addition, squinting or blinking a lot could simply be the result of a facial tic (which you should also have checked by a doctor), allergies, or tired eyes. Keep in mind that even a child’s eyes can get tired from looking at one thing for too long. Be sure to get your child’s eyes checked regularly by her doctor, and watch for any signs of vision impairments. You can help avoid further issues or damage by catching a problem early. When your baby finally does turn two, it is not a sudden free-for-all when it comes to television. There are still precautions you want to take and limits to place to ensure that TV time is fun, healthy, and safe. One of the biggest mistakes that a parent can make is assuming that because a show or game is marketed toward their child’s age group, it will be appropriate. Every parent is different and so are their children; what may be acceptable to the majority may not fit your personal beliefs or standards. There may be attitudes portrayed (i.e. expressing anger through stomping feet) or words used (i.e. “shut up” or “stupid”) that you may not deem appropriate. Always pre-screen what you are considering showing to your child. Yes, that means watching children’s programming by yourself on your free time, which may not be the most ideal, but you will regret not doing it when you see your child imitating something they saw or heard on TV. Do not assume that your toddler does not know how to use the TV remote; she is smarter than you think. She may find the remote and change the channel or find another Netflix show that looks interesting, but may not be entirely appropriate. Always be aware of what she is watching, staying close by to monitor and change anything that has not approved by you. Not only should you choose shows and games that are morally appropriate (according to your personal beliefs and standards), but you should also choose ones that are appropriate for their age and developmental level. Appropriate TV shows and apps should have an educational aspect to them. This includes teaching them social skills and communication, promote creativity, inspire off-screen play, and build on their interests (building blocks, coloring, etc.). TV shows can also offer a moral aspect, teaching life skills, or showing how to treat other people. You also want to bear in mind your child’s attention span. Starting right off the bat with a full-length Disney movie may not be the best choice, as she will probably lose interest a short ways into it. Many shows for young viewers offer episodes in 10- to 15-minute segments, offering an entire story before her mind wanders elsewhere. Even though children have the ability to understand more of what they see on TV by the age of two, that does not mean they will be able to follow the story or pull out the important pieces on their own. Toddlers can learn more from watching interactively with parents. It is best to sit with them and point out the important parts. Try to ask your child to repeat what she sees, pointing out the numbers and letters, and explaining any morals that may be present. In the same way, playing those educational games on the tablet with your child can help her learn more. Playing on her own, she may just be pressing buttons, not understanding the purpose behind what she is doing, but by playing with you, the two of you can count, sing, and draw together. There still need to be limits placed on how much TV is watched and when it is appropriate. This goes for you as well as your children, if you truly want to be successful in teaching them good media habits. Your child should also understand that other (physical) activities are encouraged and preferred. Parents need a way to unwind, and most of the time TV is the answer. However, if they want their toddlers to learn good media habits, it needs to start with them. If your child sees you sitting at your computer watching a TV show or movie, she will think it is okay for her to watch TV anytime as well. 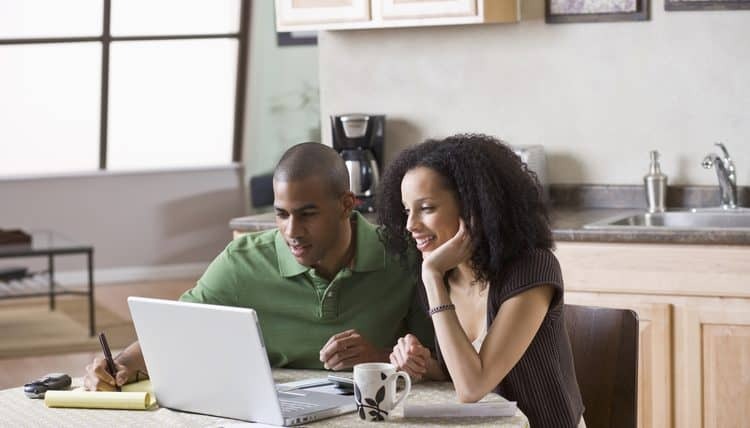 She may even begin to associate the computer with TV; even if you pull it out just to do some work, her first assumption may be that you are putting something on to watch. Break the habit and do not give your child a reason to always be thinking of the next time she can watch TV with you. If you need to unwind or catch up on your shows, wait until after she is in bed. This will not only show her that TV should not be important, but also eliminates any chance that she may see something inappropriate. In the same way, you should monitor and limit your smart phone use around and with your child. Oftentimes, parents will give their phones to toddlers with games or videos to appease them when running errands, attending appointments, or taking long car rides. Put the phone away and try to incorporate more interactive activities, such as singing in the car or playing toddler-friendly I Spy. You also need to find and designate the appropriate time(s) for watching TV. 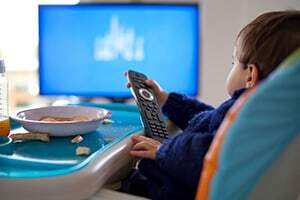 A common TV association children and toddlers can develop is the connection between food and television, since meals and snacks are two common times that the TV is on in many households. There are two main issues with this association. The first is that your child will make the connection and assume that she will always get TV time with her meals or snacks. The second – and probably most significant – is that the TV is a distraction. With it pulling your child’s attention away, you may inadvertently be creating and condoning poor eating habits, resulting in a child that does not cooperate when it is time to eat. Designate mealtime as a TV-free, interactive activity. Take that time to talk about your day as a family, or even utilizing it as teaching time. You will be surprised by what your child can pick up from a meal (colors, food names, adjectives, etc.). Instead of making mealtime TV time, find other times during the day that are more appropriate. You can make it a fun tradition, like Saturday morning cartoons, or part of a curriculum, especially if you have designated teaching time in the day. Just be sure you try to avoid any form of electronic screen within 90 minutes of nap or bedtime. In addition, you will want to limit the amount of time spent in front of the TV, both in a single sitting and total for the day. What this amount of time looks like is up to you; just make sure it is something appropriate and manageable for your child and family. Your main focus should be making TV time into something special rather than something expected. Out of everything you can do to balance your child’s TV time, the most important is to encourage activities that do not involve anything electronic. Challenge her mind and exercise her body. Take some time to go for a walk together, turning it into a scavenger hunt for leaves, bugs, birds, and flowers, or take a picnic to the park. Try reading to promote language skills (and show that interesting stories do not have to come from TV), drawing to promote creativity, and puzzles to challenge the mind and improve motor skills. According to studies and surveys conducted by the American Academy of Pediatrics (AAP), babies and children should avoid TV watching until they reach at least 2 years of age. Prior to this age, the brain is going through the majority of the growth it will experience in a child’s entire lifetime. This time should be spent wisely, encouraging interaction and motor skill development, as well as physical exercise and mental challenges. Be sure to share this with other parents who may be looking for insight into their family’s TV decisions and habits.